I wanted to give you a quick update on our efforts to fix the scheduling problems recently disclosed at Department of Veterans Affairs medical facilities across the country, including medical centers in Hampton and Richmond. The Senate on Wednesday overwhelmingly passed bipartisan legislation to begin addressing demand for care. It ensures that vets who have to travel more than 40 miles to get to a VA hospital can access private health providers closer to home, and it gives the VA secretary more authority to fire senior managers for poor job performance. I’m also proud to report that this bipartisan Senate legislation includes my proposal to put together a team of private sector data and I-T experts to go in, at no cost to tax payers, to assess the scope of the VA’s scheduling problems and recommend technology and management steps to fix it. I’m also pushing the White House to support this commonsense, private sector approach, and those discussions are proceeding as well. 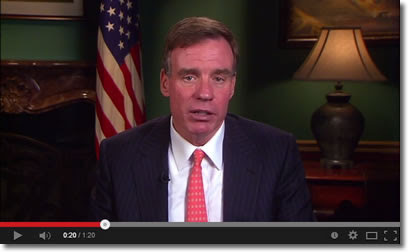 Click here to watch a short video update from Senator Warner on the VA’s scheduling problems. We already have a model for how this could work. Back in 2010, when we learned about the back office mess and data management challenges at the Army’s Arlington National Cemetery, I worked with the Army to allow a team of experts from the nonprofit, nonpartisan Northern Virginia Technology Council to recommend specific fixes for the Cemetery’s management issues. Thanks in part to the great pro bono work by members of NVTC, we upgraded Arlington Cemetery from an analog to a digital operation. In fact, you now can use a smartphone app to locate the grave of a loved one at Arlington. Every veteran who contacts the VA should be able to schedule an appointment in an efficient and timely way. I believe this private sector assistance makes sense, and this is something that can be completed quickly. I will keep you updated as we continue to push for effective solutions to address the deeper challenges at the VA. And if our office can ever be of help to you, please contact us. I encourage you to also sign-up for future newsletters like this one that discuss the specific issues of concern to you and your community. I promise never to share your email address, and I won’t clog your inbox with unwanted messages.